The Medal of Honor, established by joint resolution of Congress, 12 July 1862 (amended by Act of 9 July 1918 and Act of 25 July 1963) is awarded in the name of Congress to a person who, while a member of the Armed Services, distinguishes himself conspicuously by gallantry and intrepidity at the risk of his life above and beyond the call of duty while engaged in an action against any enemy of The United States; while engaged in military operations involving conflict with an opposing foreign force; or while serving with friendly foreign forces engaged in an armed conflict against an opposing armed force in which The United States is not a belligerent party. The deed performed must have been one of personal bravery or self-sacrifice so conspicuous as to clearly distinguish the individual above his comrades and must have involved risk of life. Incontestable proof of the performance of service is exacted and each recommendation for award of this decoration is considered on the standard of extraordinary merit. We honor the following artillerists of the Civil War who have gone 'above and beyond' the call of duty. Rank and organization: Lieutenant, U.S. Army, 1st New York Marine Artillery. Place and date: At Tranters Creek, N.C., 5 June 1862. Entered service at: Providence, R.I.
Born: 10 September 1840, Providence, R.I. Date of issue: 2 September 1893. Citation: Handled his battery with greatest coolness amidst the hottest fire. Rank and organization: Corporal, Company G, 1st Rhode Island Light Artillery. Place and date: At Petersburg, Va., 2 April 1865. Entered service at: Westerly, R.I. Date of issue: 20 June 1866. Citation: Was one of a detachment of 20 picked artillerymen who voluntarily accompanied an infantry assaulting party, and who turned upon the enemy the guns captured in the assault. Rank and organization: Sergeant, Company D, 7th New York Heavy Artillery. Place and date: At Cold Harbor, Va., 3 June 1864. Date of issue: 1 December 1864. Citation: Shot a Confederate color bearer, rushed forward and seized his colors, and although exposed to heavy fire, regained the lines in safety. Rank and organization: First Lieutenant, 2d U.S. Artillery. Place and date: From Bull Run to Spotsylvania, Va., from July 1861 to May 1864. Date of issue: 11 June 1877. Citation: Particularly distinguished services as an artillery officer. Samuel Nicoll Benjamin, born in New York City, January 13, 1839, died on Governor's island, New York Harbor, May 15, 1886. He was graduated at the United States Military Academy in 1861, and became a 2nd lieutenant in the 2nd Artillery, he served continuously throughout the Civil War, was at Bull Run, Malvern Hill, and Fredericksburg, in command of a battery at Covington, in command of the reserve artillery of the 9th Army Corps, August 14 until October 24, 1861, and was Chief of Artillery, 9th army corps, in the East Tennessee and Richmond campaigns" was at the battle of the Wilderness and also at Spottsylvania, where he was severely wounded, he was brevetted Lieutenant-Colonel May 13, 1865, and Major March 3, 1875. On recovery from his wounds he became assistant professor of mathematics at the United States Military Aacademy, and from 1869 till 1875 he was at the artillery school for practice, Fort Monroe, Virginia. Then, having been transferred to the staff, he was made Assistant Adjutant-General, and was on duty first at Washington, and later became Adjutant-General of the Department of Arizona. In June 1885, he was made Assistant Adjutant-General of the Division of the Atlantic, and assigned to Army Headquarters on Governor's island. Colonel Benjamin was one of the very few officers that held the Congressional Medal for conspicuous bravery in the field. He married a daughter of Hamilton Fish. Rank and organization: Corporal, Company B, 2d Connecticut Heavy Artillery. Place and date: At Petersburg, Va., 3 April 1865. Entered service at: Salisbury, Conn. Date of issue: 10 May 1865. Citation: Capture of battle flag. Rank and organization: Private, Company C, 1st New York Artillery. Place and date: At White Oak Swamp, Va., 30 June 1862. At Malvern Hill, Va., 1 July 1862. Citation: Continued to fight after being severely wounded. Rank and organization: First Lieutenant, Battery E, 1st Rhode Island Light Artillery. Place and date: At Chancellorsville, Va., 3 May 1863. Entered service at: Rhode Island. Born: 15 March 1834, Foster Creek, R.I. Date of issue: 13 July 1899. Citation: Though himself wounded, gallantly fought his section of the battery under a fierce fire from the enemy until his ammunition was all expended, many of the cannoneers and most of the horses killed or wounded, and the enemy within 25 yards of the guns, when, disabling one piece, he brought off the other in safety. Bucklyn was in Battery E of the 1st Regiment Light Artillery, which was organized at Providence 23 Sep 1861. Beginning with the Virginia Peninsula campaign in 1862, until being mustered out in June 1865, the unit participated almost continuously in battles, including many of the bloodiest and most important of the Civil War (including Bull Run, Fredericksburg, Chancellorsville, and Gettysburg). His tomb is in the Lower Mystic Cemetery (Fish Town) Mystic, CT.
Rank and organization: Private, Company F, Independent Pennsylvania Light Artillery. Place and date: At Gettysburg, Pa., 2 July 1863. Entered service at: Allegheny County, Pa. Date of issue: 21 December 1892. CitationSaved a 1,000 pound, 3 inch cannon of his battery under heavy musketry fire, most of the horses being killed and the drivers wounded. He and a comrade managed to get the gun to the safety of the Trostle Farm Barn. Rank and organization: Private, Company B, 1st Maine Heavy Artillery. Place and date: At Sailors Creek, Va., 6 April 1865. Entered service at: St. John, New Brunswick. Birth: St. John, New Brunswick. Rank and organization: Private, 5th Battery, Maine Light Artillery. Entered service at: Augusta, Maine. Date of issue: 7 February 1888. Citation: Nearly all the officers and men of the battery having been killed or wounded, this soldier with a comrade continued to fire his gun after the guns had ceased. The piece was then dragged off by the two, the horses having been shot, and its capture by the enemy was prevented. "The energy and endurance of the members of the Chase family is nowhere better shown than in the experience, at the battle of Gettysburg, of Capt. John F. Chase, now of St. Petersburg, Florida. At the opening of the war, when only 18 years of age, he enlisted in the 5th Maine Battery, which, in the battle of Gettysburg, was ordered on the first day of the fight, to a position near the now famous Cemetery Hill, which commanded the approach to that hill, in order to hold back the Confederate advance until the arrival of the Union forces then from 10 to 50 miles distant. There they were subject to a terrific fire. On the second day they were placed on Cemetery Hill, in such a position as to enfilade the charging Confederate columns, but exposed to two batteries from Benner's Hill. There a Confederate shrapnel shell (a projectile filled with scraps of iron and bullets) exploded within about four feet of Chase, tearing off his right arm, putting out his left eye, piercing his lungs and breaking several ribs. He received in all forty eight wounds. After lying on the field two days, without receiving aid, he was placed in a wagon with the dead. As they took him out of the wagon they discovered he was alive, and gave him a drink of water. Reviving slightly, his first words were: "Did we win the battle?" He was laid down by a barn where he lay for three days before receiving attention, as no one thought there was a possible chance for him to live. He is said to have received more wounds than any other soldier that lived. "Capt. John F. Chase was born in Chelsea, Maine, April 23, 1843. As a boy he lived on a farm in the rocky hills of Maine. Enlisted in the Civil War at Augusta, Me., April 1, 1861, at the age of 18,in the 3d Maine Reg., and later in the 5th Maine Battery. Served in most of the battles of the army of the Potomac up to the battle of Gettysburg. July 2nd, 1863, where he was very badly wounded, receiving 48 wounds, losing his right arm and left eye. He received a medal of honor for meritorious conduct at Chancellorsville May 3. 1863. Receiving his discharge from the army and after partially recovering his health he entered the mercantile business, also inventing many patents at different times. Being ordered south for his health he went to St. Petersburg, Fla., in 1895, where he was a factor in helping to build up the delightful winter tourist resort, he is survived by a wife and six children." Rank and organization: Corporal, Battery A, 1st Rhode Island Light Artillery. Place and date: At Antietam, Md., 17 September 1862. Born: 8 May 1843, Providence, R.I. Date of issue: 20 July 1897. Citation: Was wounded and taken to the rear insensible, but when partially recovered insisted on returning to the battery and resumed command of his piece, so remaining until the close of the battle. Rank and organization: Corporal, Company G, 2d Illinois Light Artillery. Place and date: At Nashville, Tenn., 15 December 1864. Entered service at: DeKalb County, Ill. Date of issue: 20 January 1897. Citation: When the fire of the enemy's batteries compelled the men of his detachment for a short time to seek shelter, he stood manfully at his post and for some minutes worked his gun alone. Rank and organization: Bugler, Battery B, 4th U.S. Artillery. Place and date: At Antietam Md., 17 September 1862. Entered service at: Cincinnati, Ohio. Date of issue: 30 June 1894. Citation: Volunteered at the age of 15 years to act as a cannoneer, and as such volunteer served a gun under a terrific fire of the enemy. Rank and organization: Private, Company G, 1st Rhode Island Light Artillery. Entered service at: Pawtucket, R.I. Date of issue: 2 November 1887. Rank and organization: First Lieutenant, Company F, 4th New York Heavy Artillery. Place and date: At South Side Railroad, Va., 2 April 1865. Born: 26 July 1842, Albany, N.Y. Date of issue: 17 January 1895. Citation: Raised the fallen colors and, rushing forward in advance of the troops, placed them on the enemy's works. Rank and organization: Private, 12th Battery, Wisconsin Light Artillery. Place and date: At Allatoona, Ga., 5 October 1864. Entered service at: Janesville, Wis. Date of issue: 20 March 1897. Citation: Took the place of a gunner who had been shot down and inspired his comrades by his bravery and effective gunnery, which contributed largely to the defeat of the enemy. Rank and organization: Private, Company C, 2d New York Heavy Artillery. Entered service at: New York. Date of issue: 3 May 1865. Rank and organization: Captain, Battery M, 15th New York Heavy Artillery. Place and date: At Petersburg, Va., 17 June 1864. Entered service at: Newburgh, N.Y.
Born: 11 January 1845, Newburgh, N.Y. Date of issue: 10 June 1896. Citation: Refused to leave the field, remaining in command after being wounded by a piece of shell, and led his command in the assault on the enemy's works on the following day. Rank and organization: Captain, Battery 1, 1st Ohio Light Artillery. Place and date: At Chancellorsville, Va., 2 May 1863. Born: 5 March 1836, Germany. Date of issue: 17 August 1893. Citation: Fought his guns until the enemy were upon him, then with one gun hauled in the road by hand he formed the rear guard and kept the enemy at bay by the rapidity of his fire and was the last man in the retreat. Rank and organization: Corporal, Chicago Mercantile Battery, Illinois Light Artillery. Place and date: At Vicksburg, Miss., 22 May 1863. Date of issue: 15 January 1895. Citation: Carried with others by hand a cannon up to and fired it through an embrasure of the enemy's works. 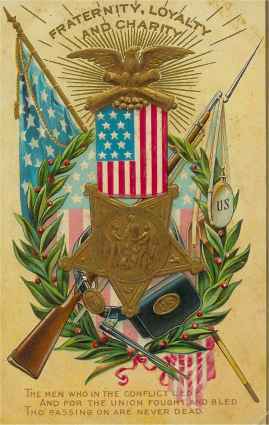 Rank and organization: Captain, 5th U.S. Artillery. Place and date: At Cedar Creek, Va., 19 October 1864. Entered service at: Wilmington, Del. Date of issue: 2 April 1898. Citation: By his distinguished gallantry, and voluntary exposure to the enemy's fire at a critical moment, when the Union line had been broken, encouraged his men to stand to their guns, checked the advance of the enemy, and brought off most of his pieces. Entered service at: Charleston, R.I. Date of issue: 28 June 1892. Citation: Was one of a detachment of 20 picked artillerymen who voluntarily accompanied an infantry assaulting party and who turned upon the enemy the guns captured in the assault. Rank and organization: Sergeant, Company G, 1st Missouri Light Artillery. Place and date: At New Madrid, Mo., 3 March 1862; at Stone River, Tenn., 31 December 1862. Entered service at: St. Louis, Mo. Date of issue: 19 September 1890. Citation: At New Madrid, Mo., remained on duty though severely wounded. While procuring ammunition from the supply train at Stone River, Tenn., was captured, but made his escape, secured the ammunition, and in less than an hour from the time of his capture had the batteries supplied. Rank and organization: Second Lieutenant, 15th Battery, Indiana Light Artillery. Place and date: Near Harpers Ferry, W. Va., 15 September 1862. Date of issue: 2 November 1896. Citation: Voluntarily gathered the men of the battery together, remanned the guns, which had been ordered abandoned by an officer, opened fire, and kept up the same on the enemy until after the surrender. Rank and organization: Sergeant, Battery A, 4th U.S. Artillery. Place and date: At Gettysburg, Pa., 3 July 1863. Date of issue: 24 August 1897. Citation: All the officers of his battery having been killed or wounded and five of its guns disabled in Pickett's assault, he succeeded to the command and fought the remaining gun with most distinguished gallantry until the battery was ordered withdrawn. Rank and organization: Sergeant, Company B, 2d Connecticut Heavy Artillery. Rank and organization: Private, Company G, 1st New York Light Artillery. Place and date: At Reams Station, Va., 25 August 1864. Born: 22 December 1822, Ireland. Date of issue: 31 October 1890. Rank and organization: Private, Battery A, 1st Missouri Light Artillery. Place and date: At Grand Gulf, Miss., 28-29 April 1863. Date of issue: 10 March 1896. Citation: With two comrades voluntarily took position on board the steamer Cheeseman, in charge of all the guns and ammunition of the battery, and remained in charge of the same for a considerable time while the steamer was unmanageable and subjected to a heavy fire from the enemy. Rank and organization: Sergeant, Battery A, 1st Missouri Light Artillery. Citation: With two comrades voluntarily took position on board the steamer Cheeseman, in charge of all the guns and ammunition of the battery, and remained in charge of the same for considerable time while the steamer was unmanageable and subjected to a heavy fire from the enemy. Rank and organization: Sergeant, Company G, 1st Rhode Island Light Artillery. Date of issue: 16 June 1866. Citation: Was one of a detachment of 20 picket artillerymen who voluntarily accompanied an infantry assaulting party and who turned upon the enemy the guns captured in the assault. Rank and organization: Sergeant, Company C, 14th New York Heavy Artillery. Place and date: At Petersburg, Va., 30 July 1864. Entered service at: Lyons, N.Y.
Citation: Capture of flag, shooting a Confederate officer who was rallying his men with the colors in his hand. Rank and organization: Captain, Company L, 14th New York Artillery. Place and date: At Petersburg, Va., 30 July 1864; 25 March 1865. Entered service at: Ogdensburg, N.Y.
Born: 30 April 1842, Macomb, St. Lawrence County, N.Y. Date of issue: 5 April 1898. Citation: In the Union assault at the Crater (30 July 1864), and in the Confederate assault repelled at Fort Haskell, displayed most conspicuous gallantry and repeatedly exposed himself voluntarily to great danger, was 3 times wounded, and suffered loss of a leg. Rank and organization: Corporal, Company F, 2d U.S. Artillery. Place and date: At Wilsons Creek, Mo., 10 August 1861. Date of issue: 19 July 1890. Rank and organization: Sergeant, Company E, 2d U.S. Artillery. Place and date: At Richmond, Va., 27 June 1862. Date of issue: 2 April 1878. Citation: Gallant and meritorious service during the 7 days' battles before Richmond, Va.
Rank and organization: Corporal, Company H, 15th New York Heavy Artillery. Place and date: At Five Forks, Va., 1 April 1865. Rank and organization: Private, Company M, 2d U.S. Artillery. Place and date: At Trevilian Station, Va., 11 June 1864. Date of issue: 19 August 1892. Citation: Remained at his gun, res1sting with its implements the advancing cavalry, and thus secured the retreat of his detachment. Rank and organization: First Lieutenant, 4th U.S. Artillery. Place and date: At White Oak Swamp Bridge, Va., 30 June 1862. Citation: This officer, when his captain was wounded, succeeded to the command of two batteries while engaged against a superior force of the enemy and fought his guns most gallantly until compelled to retire. Rank and Organization: Private, Chicago Mercantile Battery, Illinois Light Artillery. Rank and organization: Second Lieutenant, 15th New York Battery. Date of issue: 18 October 1892. Citation: Held his ground with the battery after the other batteries had fallen back until compelled to draw his piece off by hand; he was severely wounded. Entered service at: Coventry, R.I.
lace and date: At Petersburg, Va., 18 June 1864.
ate of issue: 30 July 1896. Citation: As gunner of his piece, inflicted singly a great loss upon the enemy and distinguished himself in the removal of the piece while under a heavy fire. Rank and organization: First Lieutenant, 2d Independent Battery, Massachusetts Light Artillery. Place and date: At Grand Coteau, La., 3 November 1863. Born: 11 March 1839, Andover, Mass. Date of issue: 16 February 1897. Citation: After having been surrounded by the enemy's cavalry, his support having surrendered, he ordered a charge and saved the section of the battery that was under his command. Rank and organization: Private, Company L, 1st Connecticut Heavy Artillery. Place and date: At Fort Stedman, Va., 25 March 1865. Entered service at: Warwick, R.I. Date of issue: 21 July 1865. Rank and organization: Corporal, Battery D, 5th U.S. Artillery. Place and date: At Bull Run, Va., 21 July 1861. Date of issue: 28 August 1897. Citation: Through his personal exertions under a heavy fire, one of the guns of his battery was brought off the field; all the other guns were lost. Citation: Carried with others by hand a cannon up to and fired it through an embrasure of the enemy's work. Entered service at: West Greenwich, R.I.
Rank and organization: Private, Company L, 1st Connecticut Artillery. Place and date: At Petersburg, Va., 25 March 1865. Entered service at: New Haven, Conn. Date of issue: 29 October 1886. Citation: A piece of artillery having been silenced by the enemy, this soldier voluntarily ass1sted in working the piece, conducting himself throughout the engagement in a gallant and fearless manner. Place and date: At Grand Gulf, Miss., 28_29 April 1863. Citation: With 2 comrades voluntarily took position on board the steamer Cheeseman, in charge of all the guns and ammunition of the battery, and remained in charge of the same, although the steamer became unmanageable and was exposed for some time to a heavy fire from the enemy. Date of issue: 4 March 1886. Rank and organization: Bugler, 9th Independent Battery, Massachusetts Light Artillery. Date of issue: 16 August 1895. Citation: Rescued his wounded captain from between the lines. Charles Reed served with the 9th Massachusetts Battery until November, 1864, when he was detailed to the topographical engineers, the army at long last taking advantage of his artistic ability. The war allowed Reed to improve his talent, for he established himself as a well-known artist upon his return to Boston. His illustrations appeared in the Boston Globe, and in numerous books, such as Hard Tack and Coffee and Battles and Leaders of the Civil War. Reed's drive enabled him to continue working well into his early 80's until his death on April 24, 1926. Throughout his life, the former bugler managed to stay in touch with his former commander, and then friend, John Bigelow. Like other veterans of the battery, Reed was fond of his former captain, recalling, "we are proud of all of our officers[,] they were constantly in the thickest of the fighting[.]" Rank and organization: Sergeant, 34th New York Battery. Place and date. At Spotsylvania, Va., 12 May 1864. Date of issue: 10 July 1896. Citation: Encouraged his cannoneers to hold a very dangerous position, and when all depended on several good shots it was from his piece that the most effective were delivered, causing the enemy's fire to cease and thereby relieving the critical position of the Federal troops. Sergeant Rossbach was laid to rest in Cypress Hills National Cemetary, Brooklyn, New York. Rank and organization: First Lieutenant, 11th Battery, Ohio Light Artillery. Place and date: At Iuka, Miss., 19 September 1862. Entered service at: Bucyrus, Ohio. Born: 10 March 1832, Delaware County, N.Y. Date of issue: 31 December 1892. Citation: Although severely wounded, fought his battery until the cannoneers and horses were nearly all killed or wounded. Rank and organization: Private, Company D, 2d New York Heavy Artillery. Entered service at: Liberty, N.Y. Date of issue: 24 April 1865. Rank and organization: Sergeant, Battery E, 1st New York Light Artillery. Place and date. At Warwick Courthouse, Va., 6 April 1862. Entered service at: Bath, N.Y. Date of issue: 6 August 1906. Citation: This soldier, when a shell struck an ammunition chest exploding a number of cartridges and setting fire to the packing tow, procured water and extinguished the fire, thus preventing the explosion of the remaining ammunition. Rank and organization: Corporal, Battery H, 3d New York Light Artillery. Place and date: At Washington, N.C., 6 September 1862. Entered service at: Madison, N.Y. Date of issue: 24 April 1896. Citation: Took command of a gun (the lieutenant in charge having disappeared) and fired the same so rapidly and effectively that the enemy was repulsed, although for a time a hand-to-hand conflict was had over the gun. Place and date: At Campbell Station, Tenn., 16 November 1863. Date of issue: 30 July 1896. Citation; Brought off his piece without losing a man. Date of issue: 21 December 1894. Rank and organization: Private, Company I, 4th New York Heavy Artillery. Place and date: At White Oak Road, Va., 1 April 1865. Entered service at: Port Jarvis, N.Y. Date of issue: 22 April 1896. Citation: Made a hazardous reconnaissance through timber and slashings preceding the Union line of battle, signaling the troops and leading them through the obstruction. Rank and organization: Private, Company K, 4th New York Heavy Artillery. Entered service at: Sandy Creek, N.Y.
Citation: Made a hazardous reconnaissance through timber and slashings, preceding the Union line of battle, signaling the troops and leading them through the obstructions. Rank and organization: Sergeant, Light Battery F, 5th U.S. Artillery. Place and date: At White Oak Swamp Bridge, Va.. 30 June 1862. Date of issue: 4 April 1898. Citation: Was 1 of a party of 3 who, under heavy fire of advancing enemy, voluntarily secured and saved from capture a field gun belonging to another battery, and which had been deserted by its officers and men. Rank and organization: Captain, Chicago Mercantile Battery, Illinois Light Artillery. ate of issue: 15 January 1895. Rank and organization: First Lieutenant, 5th Battery, Maine Light Artillery. Place and date: At Fishers Hill, Va., 22 September 1864. Entered service at: Gorham, Maine. Date of issue: 13 January 1892. Citation: While acting as assistant adjutant general, Artillery brigade, 6th Army Corps, went over the enemy's works, mounted, with the assaulting column, to gain quicker possession of the guns and to turn them upon the enemy. Rank and organization: Sergeant, Company G, 8th New York Heavy Artillery. Date of issue: 1 April 1898. Citation: Voluntarily exposed himself to the fire of the enemy's sharpshooters and located the body of his colonel who had been killed close to the enemy's lines. Under cover of darkness, with 4 companions, he recovered the body and brought it within the Union lines, having approached within a few feet of the Confederate pickets while so engaged. Place and date: At Trevilian Station, Va., 12 June 1864. Entered service at: San Francisco, Calif. Date of issue: 6 April 1892. Born at Norwich, Vermont, July 15, 1837, he graduated from Norwich University in 1856 and was appointed from California as a Second Lieutenant, 2nd United States Artillery on August 5, 1861. He was promoted to First Lieutenant, September 27, 1861; Captain, March 8, 1865; Major, 3rd U.S. Artillery, March 22, 1885; Lieutenant Colonel, February 12, 1895; Colonel, 6th U.S. Artillery, March 8, 1898; Brigadier General of Volunteers, March 4, 1898; discharged from the volunteer service, June 12, 1899; retired by operation of law, July 15, 1900, and advanced to Brigadier General on the retired list, by Act of Congress of April 23, 1904. He earned the Medal of Honor during the Civil War and it was finally awarded to him on April 6, 1892 for "distinguished gallantry in action at Trevillian Station, Virginia, June 2, 1864." He was breveted Captain, May 3, 1863 for "gallant and meritorious services in action at Salem Heights, Virginia; breveted Major, July 3, 1863 for the same at the Battle of Gettysburg; Lieutenant Colonel, September 19, 1864 for the same in the Battle of Winchester, Virginia; Colonel, March 13, 1865 for the same during the war. He made his retirement home in Portland, Oregon, and died on April 24, 1920. He was buried in Section 1 of Arlington National Cemetery. His wife, Flora E. Chatfield Williston (September 26, 1861-December 24, 1944), is buried with him. Place and date: At Newbys Crossroads, Va., 24 July 1863. Entered service at: Washington, D.C. Date of issue: 1 September 1893. Citation: While in command of a section of a battery constituting a portion of the rear guard of a division then retiring before the advance of a corps of Infantry was attacked by the enemy and ordered to abandon his guns. Lt. Woodruff disregarded the orders received and aided in repelling the attack and saving the guns.